1. meeting procedures, etiquette, welcome newcomers. presenter: sarah campbell, president, unless otherwise noted below. you can now pay your dues through our website www.srccatx.org by using the PayPal buttons for either the individual or family membership. you can pay with a credit card without being a PayPal member. 4. site plan/conditional use permit for change of use from liquor sales to “cocktail lounge and associated improvements” at 343 s congress at riverside drive. SPC-2011-0082CS. presenters: nikelle meade for applicant, jean mather and/or teresa griffin, co-chairs planning and zoning committee and officers of NPCT. the presenter for the property asked to postpone this item. 5. marc and tracy frazier, owners of S Congress Athletic Club. introduction by connie todd, member. this neighborhood health club is located behind doc’s (with lots of parking) and open 6am-9pm M-F, 7-4 saturday and 10-4 sunday. the cost to join is $50 but can be split with another person if you both join at the same time. fees are $45 a month with a minimum three month term. SCAC offers personalized training plans from their highly skilled personnel which includes massage therapists, a physical therapist and soon a general practitioner with a physical therapy background who is also an ultra-marathoner. group training is limited to 3-6 people so you get personal attention and guidance. if you’re considering implementing a healthy routine or tweaking the one you already have, stop by SCAC and let them talk to you about what they have to offer, rumor has it you won’t be disappointed. 6. COA proposed special exemptions and fee waivers for certain code violations in sf-3 zoning. canceled because city council consideration date for item has passed. 7. neighborhood watch pilot program. presenters: dennis cudd, marc davis and shelly leibham, members. the idea is to focus our attention and efforts on a smaller area first with the intention of applying what we learn to the greater SRCC. areas 4A and 4B had the most volunteers and the most crime reported so this is the focus of the pilot program. the process is to 1st offer help to the victims (this also applies to anyone outside of the pilot areas) to make sure they have everything they need. 2nd is to flyer the immediate area to notify neighbors of the incident and encourage them to be vigilant and avoid being an easy target (ie: don’t leave things in your vehicle you don’t want stolen). 3rd is to car patrol the area regularly with high visibility including official Neighborhood Watch magnetic signs on cars and possibly t-shirts to let potential criminals know we’re watching. 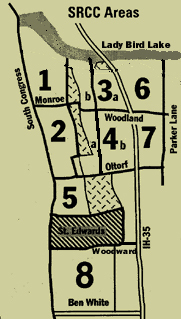 the proposed area encompasses 12 blocks. volunteers will receive training and John Luther of barton hills is certified and willing to help. our resident constable, maria conchola, has also offered to do what she can to increase the constable presence in the area. the presenters asked the membership to vote to contribute money to the cause to cover some or all of the expense of kick-starting the program along with several options to do so. 8. illegal tree cutting at 1208 woodland ave. proposed resolution to compose letter to city, fiercely denouncing this activity and requesting maximum fines/punishment against the owner. the owner had a company cut down a number of trees on the property including three protected — one a heritage oak, done without any permits, notification or permission to do so. Sarah recommended that the letter include a requirement that a building permit be released for a plan only if it reflected the trees still on site, as if they had never been cut. 9. proposed amendment to LDC, affecting homebuyers in the extra-territorial jurisdiction, C20-2011-009. 10. activity at 1301 newning causing alarm. there was no one present to speak about this. 11. street closures: (A) batfest, 4am aug 27th-4am aug 28, 2011. congress ave bridge to be closed. (B) austin triathlon, 6am-11am sept 5, 2011, s congress to be closed except for single lane north to cesar cavez and single lane south from barton springs rd. (C) livestrong run oct 15th. (A) the riverside corridor plan meeting has been pushed back to august and the FLUM changed to a special district zoning that will override existing conditional overlays fought for by the neighborhood and imposed on developers in areas 6+7 as part of negotiations. this would constitute a huge loss for the SRCC and EROC in particular. (B) pepper’s bistro wants to change from a restaurant/bar to a cocktail lounge with late hours. located near arena/riverside with this area already having 29,000 sq/ft of liquor sales. (A) the newsletter is published and being delivered. (B) a small neighborhood watch is organizing along Woodland Ave from travis heights to chelsea, with sarah campbell and sandy booth as block captains. (D) if you have any of the older SRCC neigborhood signs, please use them or return them. Also, please let Jean Mather know you have one and your address so we can map locations for improved distribution. (E) area 8 traffic calming plan has the approval of 4 of 5 required city departments needed to start construction. next step is to have residents vote — 60% of them must support it. the plan includes 7 traffic calming islands on Willow Springs Dr and Woodward St.
14. SRCC executive officer shuffling to begin late summer/early fall. mark davis, the VP, will prepare agendas and run the general membership meetings while sarah campbell, the Prez, focuses on other projects that will develop the role of VP, which is very weak within SRCC bylaws. (A) norwood house – the city’s feasibility study is coming to an end. the city has expressed its intention to move the dog park although no alternate location has been determined. the city council previously supported the restoration of the house so a meeting with the mayor and council to push for a not-for-profit restoration is the next step. (B) SCIP – south congress improvement project – plan is to resurface congress from oltorf to the congress bridge and then stripe it for back in angled parking, southbound bike lane and northbound sharrow. beyond that there is no consensus between the residents and businesses in the area on how to deal with the increasing strain overflow parking and littering is putting on the residents.